This Circuit helps in the monitoring of mains supply voltage. 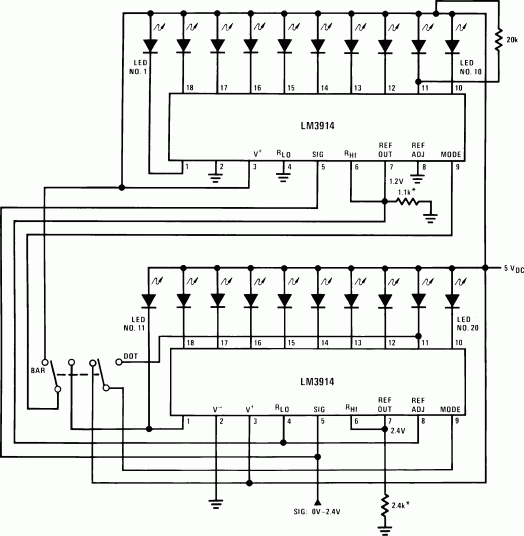 LM3914 bar graph indicator is used for a better display. It is just like an LED Analog Voltmeter. C1 limits the current and drops most of the voltage. The zener regulated supply is for the chip. C2 can be raised to 220uF or more if required. The bar mode display may consume more power. Use dot mode only on capacitor power. Bar mode will need a bigger cap or a transformer supply. 20-Segment Meter with Mode Switch - Cascading is required if you want more resolution. 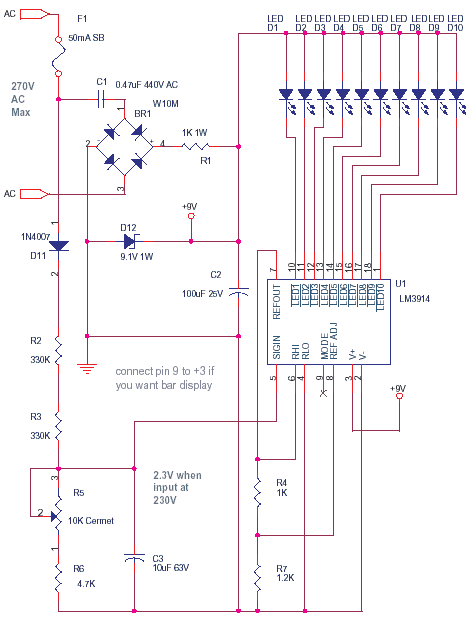 Example for measuring 20V, you want to show in 1V per LED steps. It can withstand +/- 35 Volts input upper limit. The inbuilt reference is 1.2V use it as shown in the Typical Application. This also helps in setting the brightness of LED display. You may need to use external attenuators, buffers or precision rectifiers to measure AC voltages or High Level DC voltages.